Is it too early in the day to talk about dicks? No? Good. 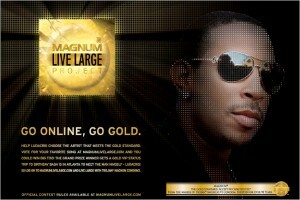 Trojan's Magnum Condoms, the brand geared towards, ahem, plus-sized fellas, has launched an ad campaign called the Magnum Live Large Project. With the campaign comes an online contest where folks can download backing tracks from Magnum's site and lay down some hot condom-themed lyrics over the top. I'm not joking. The spokesman for Magnum's first ever ad campaign? Atlanta's Chris "Ludacris" Bridges. The winner of the aforementioned condom-rap contest will win $5k and a trip to the A to be "congratulated onstage" by Luda at Hot 107.9's Birthday Bash.